Deliciously moist alternating swirls of chocolate and banana cake, wrapped in bittersweet dark chocolate ganache....need I say more? If you want this cake to be gluten-free too, simply replace the plain flour with the same weight gluten-free plain flour and make sure your baking powder is gluten-free (in New Zealand, Edmonds baking powder is gluten-free). 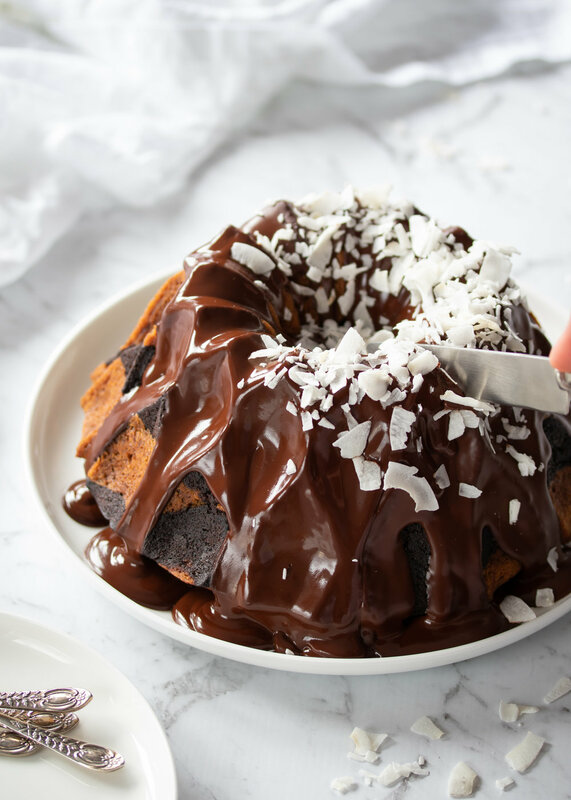 If you do not have a Bundt cake tin, you can bake the cake in two 22cm diameter round tins or halve the recipe for a small loaf cake. To start, thoroughly grease the cake tin (using canola baking spray or another plant based product). Preheat the oven to 180°C (160°C fan). Sieve together the flour, ground almonds, baking powder, baking soda and salt in a medium bowl and set aside. Melt the coconut oil in a heat proof bowl in the microwave until it is completely liquefied. Mash the bananas with a fork, then place the mashed bananas in a large mixing bowl. Add the brown sugar, almond milk (250ml), vanilla and melted coconut oil and combine using a hand whisk until smooth. Add the sieved dry ingredients and mix until smooth. In a separate mixing bowl, mix the cocoa powder and remaining almond milk (120ml) to form a smooth paste. Add about a third of the banana cake mixture and whisk until smooth. Spoon big dollops of the two mixtures alternatively into the cake tin. Swirl a knife once or twice through the batter to create a marble effect (be careful not to mix it too much as the definition between the two batters will be lost). Bake for approximately 1 hour until the cake is golden in colour and a skewer inserted into the cake comes out fairly clean (this cake is deliciously moist, so a little bit of cake sticking to the skewer is just about right, as long as it is not raw cake batter). Once baked, place a wire cooling rack over the tin and invert it to turn out the cake. Cover with a clean tea towel and leave it to cool. Once the cake is cool, make the ganache. Place the chocolate (broken into pieces or roughly chopped) and coconut cream in a heat proof bowl. Microwave together for about 10 seconds at a time whisking a little in-between bursts until smooth. Decorate with coconut flakes if you like. Enjoy!